Crusaders will have skipper Colin Coates back as they attempt to claw back a three-goal deficit against Skenderbeu in the Champions League. The Irish Premiership side lost last week's first leg in Albania 4-1 but still believe they can get through to the third qualifying round. Central defender Coates missed that game as he was on holiday. 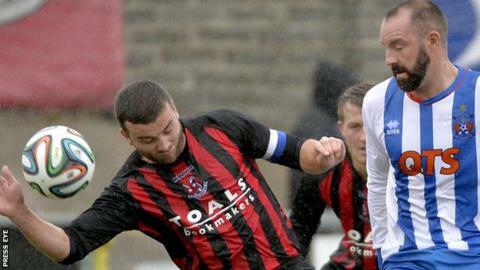 Winger Paul Heatley will miss Tuesday's Seaview game as he is away on holiday while Jordan Forsythe is injured. Midfielder Forsythe's replacement could be 19-year-old Gavin Whyte who has not been able to play in any of the Champions League games because of an ankle problem. Whyte was not in the Crues squad for Saturday's friendly against Kilmarnock, although Coates was back in the team for the match in Belfast which the Scottish Premier side won 4-0. "This game could go one of two ways - we will either get ourselves into the tie early on, or if we leave ourselves open to the counter-attack and they score, it could be over fairly quickly," said Crusaders manager Stephen Baxter. "If we get a goal and then get another one it sets it up very nicely. We will certainly give it a go and at least we can say that we tried. "In any case, reaching the second qualifying round is an achievement and gives us a good base to build our season around, particularly financially." Skenderbeu or Crusaders will face Bulgarian side Ludogorets or Moldovans Milsami in the third qualifying round.